The Shivering Isles, also called the Madhouse or the Asylums,[UOL 1] is the Daedric realm of Sheogorath, Prince of Madness. The realm consists of a main landmass surrounded by a group of smaller islands, the area of which is divided in half: the northern half of these lands is called Mania, and the southern half Dementia. This divide represents Sheogorath's split personality, the "two shades of madness". The isles are inhabited by mortals as well as Daedra, but they have been driven insane. The Shivering Isles was originally the Realm of Order, the domain of Jyggalag. The other Daedric Princes feared Jyggalag's immense power, so they cursed him to become the Prince of what he despised most of all: Madness. Jyggalag became Sheogorath, and destroyed all aspects of order in the realm. 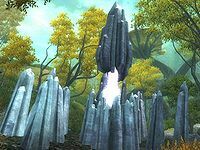 Only two relics remained: the many crystal obelisks which dot the Isles, which he could not permanently remove; and Dyus, Jyggalag's chamberlain and the keeper of the Great Library of Jyggalag, which contained the logical prediction of every action ever taken by any creature, mortal or Daedric. When Sheogorath discovered the library he had it burned, insisting that it was an abomination and that personal choice defied logical prediction. However, he could not bring himself to destroy the knowledge that Dyus possesses, so instead he forbade him from dying and imprisoned him in the ruins of the library at Knifepoint Hollow. At the end of every era, Sheogorath was allowed to take his true form and retake the realm. This event is known as the Greymarch. It begins with the appearance of the Knights of Order, who slowly invade the isles using the obelisks as conduits. Many of Sheogorath's subjects default, and become Priests of Order. The cycle is completed when Jyggalag himself appears and takes the Palace, capturing the Font of Madness. Sheogorath is then left to rebuild his dead realm. This age-old cycle was supposedly ended in 3E 433 when the Champion of Cyrodiil became Sheogorath's champion, and aided the Prince in halting the Forces of Order. The Champion rose in ranks in the Court of Madness, and fulfilled many tasks to prevent the populace from turning to Order. In the end it was of no use, and Sheogorath disappeared. The Champion took on the role of the Madgod with the aid of Haskill and Dyus by recreating the Staff of Sheogorath, the symbol of power in the Isles. In a final battle against Jyggalag, the Champion emerged victorious and freed the Prince from his curse. Jyggalag thanked the Champion, and departed for the Waters of Oblivion, leaving the Champion to rule the realm as the new Prince of Madness. However, this mantling process seemingly takes place every Greymarch, raising the possibility that the Champion's participation in the Greymarch was simply part of the cycle. As Sheogorath, the Champion of Cyrodiil stated that the title of Mad God is one which "gets passed down from me to myself every few thousand years". Travelers from Tamriel passed through the realm in the early Fourth Era. Circa 4E 201, Sheogorath abandoned the realm on a "vacation", visiting the mind of long-dead Thoriz Pelagius Septim III the Mad. Dervenin, the Priest of Mania, came in search of the Mad God to beg him to return, eventually coming to the city of Solitude in Skyrim. With the help of the Last Dragonborn, Dervenin persuaded Sheogorath to return to the Shivering Isles. 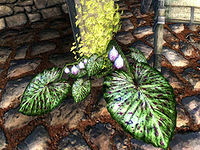 The Shivering Isles consists of one major island with two distinct regions. The Enjaen Sea borders to the east, with the Emean Sea to the west. The northern highlands of Mania reflect the lighthearted side of its ruler's madness. 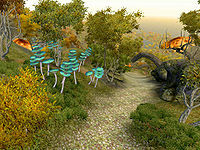 It is similar to Vvardenfell's West Gash region in appearance, with expansive grasslands and huge mushroom trees. Overlook Road passes through the region. 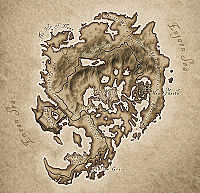 The Isle of Flame, the Laughing Coast, the peninsula of Saint's Watch, and the Jester's Spine Mountains are important geographical features in the region. The villages of Highcross and Hale appear welcoming but are populated by harmless maniacs. The halls of Brellach contain the Wellspring of the Aureal. The lawbreakers of the region are imprisoned in the deadly ruins of Aichan. 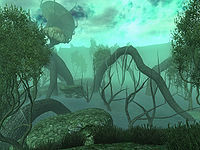 The marshy lowlands of Dementia represent the dark and violent side of Sheogorath, and are mostly made up of swamps and forests of dead trees. The Low Road and Pinnacle Road are the two main routes through the region. Two peninsulas can be found here: the Heretic's Horn and the Madgod's Boot. The marshes of Shallow Grave and the Hill of Suicides are also important landmarks. The villages of Deepwallow and Fellmoor offer relative safety from the monsters that roam the swamps. The ruins of Vitharn are a place of ill repute, once populated by souls cursed by Sheogorath. The Halls of Pinnacle Rock contain the Wellspring of the Mazken. The lawbreakers of the region are imprisoned in the root tunnels of Corpserot Passage. The capital city of the realm is New Sheoth which lies on the eastern side of the Isles. It is also divided into two sections, Bliss on the Manic side and Crucible on the Demented. Sheogorath's palace lies adjacent. The town of Split also lies along the divide, as does the Fringe. The Fringe is an enclosed area of the Isles, where new inhabitants of the Isles reside until their madness sets in. The only way out is through the Gates of Madness, guarded by a giant Flesh Atronach known as the Gatekeeper. This area is linked to the portal in Niben Bay, but is not the portal's only destination. The small village of Passwall is the only settlement within the Fringe, and is periodically abandoned when its inhabitants are given access to the realm proper. It has existed since the Isles were created, and serves as a defensible outpost. During the Greymarch of 3E 433, the Fringe was taken by Order. The Spire in Passwall was revealed to be a gate for the Forces of Order, and was subsequently destroyed by the Champion of Cyrodiil. The Isles are dotted with the ruins of past civilizations. These are the fractured pieces of ancient settlements which were abandoned during a past Greymarch. Madness ore deposits can be found naturally occurring in the ruins. The spirits of ancient souls are trapped in the ore, which can be shaped into armor and weapons by the master smith of Crucible. Extensive root caves run beneath the ground, and are accessible through the weak membrane found at the base of mushroom trees. Amber forms where the tunnels are damaged, which can be hammered into lightweight armor and weapons by the master smith of Bliss. Many camps can be found out in the wilderness, home to the criminals that even the mad shun. Obelisks of Order are one of the last remaining elements of Order in the Isles. They can be seen jutting from the ground throughout the countryside. They sometimes serve a useful purpose, such as the Resonator of Judgement, but the true nature of the obelisks is much more sinister. During the Greymarch, priests of Order bind themselves to an obelisk to activate it. This makes the priest temporarily immortal, as long as the obelisk remains active. Obelisks act as a conduit to allow Knights of Order into the realm which slay the local wildlife and the citizens of the Isles. Although incredibly difficult, obelisks can be overloaded and shut down by throwing Hearts of Order into their glowing center. These crystalline hearts can be cut from the bodies of the Knights of Order, and are the main power source for the priests. When the obelisk has been deactivated, it will be permanently disabled. Each obelisk is linked to a Crystal Chest. These contain many riches, which can either be summoned from the deactivated obelisk or taken from the chest itself, which only opens when a Heart of Order is inserted into it. The Isles have a unique ecosystem based around the native fungi. The majority of the realm's flora are of a fungal nature, from the subterranean Withering Moon to the giant Mushroom Trees. All plantlife in the Isles are connected to the Root System. This is the system of underground root tunnels, which is tended to by the tree-like gnarls. It is theorized that the Root is a single organism, which draws the color from Dementia and transplants it into Mania. However, this idea is considered heresy against Lord Sheogorath, who is said to have blessed the land with two temperaments. The grummites are an amphibious race of humanoid tribal creatures, who are said to be the original inhabitants of the Shivering Isles. It is unknown if they worship Sheogorath, but they have an affinity for madness ore. They are very aggressive, and use their crude weapons to great effect. They signify focus crystals as something of religious importance, and their magi can harness the power contained in them. They lay their eggs in sacs, often hanging over water. Grummite eggs are often eaten as food, despite their detrimental effects. The baliwog is thought to be the younger form of the grummite, although some say they grow up into scalon, disease-ridden beasts with tremendous jumping abilities (this theory is debatable however, as scalon have a differing hatchling from baliwogs). Baliwogs have been known to produce pearls. The Elytra is a giant insect native to the Isles. Some produce a rare ichor known as Felldew, which is a potent and very addictive drug. Like all the creatures of the Isles, their coloration depends on what region they reside in. Demented creatures have dark, murky colors, while Manic creatures have bright, vibrant colors. Being a Daedric realm, the Isles are of course populated with various Daedra. Hungers are a common sight, being one of Sheogorath's favorite pets. Although not welcome in the Isles, Knights of Order invade during the Greymarch, using the obelisks as conduits. Golden Saints and Dark Seducers are the spawn of the Madgod, and the realm is their home. The Golden Saints, who call themselves the Aureals, are reborn from the Waters of Oblivion at their Wellhead in Brellach and guard Mania. The Dark Seducers, who call themselves the Mazken, are likewise reborn at their Wellhead in the halls of Pinnacle Rock and guard Dementia. The two clans are constantly at odds as they attempt to become Sheogorath's favored. Like Tamriel, the realm is also plagued by the living dead. Often times Lord Sheogorath will curse a mortal's spirit to forever roam the Isles as punishment for offending the Prince. A prominent example of this is the Hill of Suicides, where citizens who take their own life must spend an eternity unless freed by the living. Necromancy is not uncommon; in fact the Isles even have unique necromantic minions such as the skinned hound and the shambles. Sheogorath encourages the sorceress Relmyna Verenim's cruel study of the "sixth element", Flesh, and invited her to the Isles when the Mages Guild rejected her. Flesh Atronachs, a rare sight in Tamriel, can be found all over the Isles. Relmyna creates these constructs by infusing the void essence of a Daedra within a humanoid body stitched together from enchanted body parts. Relmyna is the "mother" of the Gatekeepers, and created the design in the Gardens of Flesh and Bone at great personal cost. Most of the inhabitants of the Shivering Isles naturally worship Sheogorath. Most houses have a bust of the Mad God, and offerings of lettuce, spools of yarn or soul gems are often left by them. Many books dedicated to the worship of the Mad God have been written, such as The Blessings of Sheogorath. Those who reject Sheogorath are declared heretics and shunned from society. They often make camp in the wilds of Mania, and summon Hungers to do their bidding. Some worship other gods, such as the deluded worshippers in Fain who make human sacrifices to Gyub, Lord of the Pit. An order who call themselves the Apostles was set up a mysterious leader named Ciirta. Ciirta discovered Sheogorath's absence during the second last Greymarch, and believed Sheogorath had forsaken his people. Ciirta was killed in 3E 433 by a group of traitors in the order, who were aided by the Champion of Cyrodiil. Her eyeball was later used to reforge the Staff of Sheogorath. The Prophet Arden-Sul is another popular object of worship. The Sacellum Arden-Sul is located in New Sheoth, and contains the Altar of Arden-Sul. The Flame of Agnon, taken from the original capital of Cylarne, is usually alight in the Sacellum and acts as a beacon of hope for the people. The Manics and the Demented have wildly different beliefs over the true nature of Arden-Sul and will preach their own teachings in the Sacellum, depending on which faction is in power. The Blessing of Arden-Sul is needed to successfully coronate a new duke or duchess. Some extremists believe that Arden-Sul was the mortal aspect of Sheogorath, and set up camp in the swamps of Dementia, killing all who disagree with their beliefs and using Flesh Atronachs to protect their bases. These extremists are known as zealots. When the Greymarch begins, many of the more delicate citizens of the Isles turn to the worship of Jyggalag and become Priests of Order. This treachery pains Sheogorath, and stopping the populace from converting was a major part of his efforts in 3E 433 to halt the Greymarch. The realm's ruling body is the Court of Madness. Every citizen of the Isles has a place in the Court. Mania and Dementia are treated as duchies, ruled over by their respected duke or duchess. Both regions are aligned with Sheogorath's Daedric army; the Golden Saints guard Mania, while the Dark Seducers protect Dementia. The highest rank in the Court of Madness is Madgod, which of course belongs to Lord Sheogorath. The Madgod oversees the affairs of the realm, with help from the Chamberlain. The Court is based in New Sheoth Palace, which contains the House of Mania, the House of Dementia, the Palace of Sheogorath and the Fountainhead. Vitharn, a once-great keep and county founded by fanatics, ruled over Dementia for four generations and planned to usurp the Madgod. Sheogorath was amused by this and allowed the treason to continue, but when the keep was overrun by a vassal tribe he cursed the souls to forever relive their final moment. The curse was broken in 3E 433, and the ruins have been quiet ever since. The realm's justice system is similar to Imperial law. Theft, assault and murder are all punishable by fines or jailtime. Prisoners are held in dangerous dungeons far away from civilization, and prisoners have the option of serving their time or leaving their cell and braving the depths of the dungeon. Criminals who resist arrest are promptly slain by the Daedric guards. Patrols along the main roads kill the dangerous creatures who wander nearby. Even Sheogorath himself is subject to his law, but will not be imprisoned. The Fringe is under the same justice system as the Isles proper, but as no guards are posted within its walls, the bounty only comes into effect once the criminal passes through the Gates of Madness. Attempting to grow a beard or attacking the Madgod is a crime punishable by execution. Those personally executed by Sheogorath are teleported several thousand feet above Execution Point, where they fall to their death. The home of the Aureal, located on the Saints Watch peninsula. A ruin located in Mania. A ruin on the Isle of Flame, home to the Cold Flame of Agnon. A mausoleum located on the eastern side of Mania. A ruin located in the Jester's Spine Mountains. A ruin located on the Heretics Horn. The capital of the Isles, located on the eastern divide between Mania and Dementia. The home of the Mazken, located on the Madgod's Boot peninsula. A ruined city located in Shallow Grave. A facility located along Pinnacle Road. The chamberlain of Jyggalag was known as "Dyus of Mytheria" and was the keeper of his Great Library, which was a location in Jyggalag's realm of Order before Sheogorath's rise. It is unknown what location "Mytheria" refers to, with even Dyus not remembering if it was a real place, but it may have some relation to the realm preceding the Shivering Isles. This page was last modified on 24 March 2019, at 01:31.